We would like to draw the attention of our readers to a new book by Uri Marcus: If? The End of a Messianic Lie. In its 550 pages the author engages for the project of a refutation of the Trinity doctrine of the Christian Church. With arguments based on the Hebrew Bible, ancient Jewish tradition and the writings of the Sages, and the Apostolic Scriptures, Marcus shows that the legitimate historical continuity of the faith of the Patriarchs, the nation of Israel, and the first followers of Messiah Yeshua, is found in the doctrine that HaShem is One Person and that only the Father, not the Son, is HaShem. The author presents his theological case in a popular and readable style, which sometimes shows a forthright and challenging attitude. To say it in a paradoxical way: the virtue of chutzpah is not entirely absent from it. It should be mentioned however that the theological views and biblical explorations of the book are surrounded by and embedded in a more personal story which at times is tumultuous and which reveals the heated and passionate nature of the emotions that are evoked by attacking the traditional Christian doctrines of the Deity of Yeshua and the Trinity. Marcus doesn’t eschew making accusations or recounting personal and ministerial conflicts. While we recommend Marcus’ book because of its theological importance, we want to make clear that we have our reservations on the other material in it. We cannot extend our recommendation to the story of the author’s personal conflicts and the complications and entanglements he has gone through in his ministry. To evaluate these aspects of the book goes simply beyond our competence and interest, which is limited to matters of theology and philosophy. Within a foreseeable time we intend to give a review of this important work. For those interested, it can be ordered at: Above & Beyond . Tu B’Shevat, the New Year of Trees, is the first sign on the Calendar that the solemnities of Passover are approaching. Passover always falls in the Spring season and Tu B’Shevat is the earliest indicator of Spring. It is the time when in Eretz Yisrael the tree fruits become visible, and here, in the North-West of Europe, the first buds shoot up. The Sages have determined this date, the 15th of Shevat, as the beginning of the agricultural “fiscal year”. The annual and triennial tithings, and the laws of orlah, are to be reckoned from this date. In the course of time Tu B’Shevat developed into a minor festival, and in the 17th century some kabbalistic groups have introduced the idea of a Tu B’Shevat Seder, in which the seven fruits of the Land — wheat, barley, grapes, figs, pomegranates, olives, and dates — and numerous other tree fruits are consumed in a ritual order. Tu B’Shevat is also the natural starting point for the big annual job that must be performed before we are able to properly celebrate Passover: the thorough cleansing of the house and the removal of chametz from all parts of our domain. Although I don’t look favourably on kabbalistic philosophy and certainly don’t want to follow kabbalistic ritual symbolism, yet I have to admit that the basic thought of a Tu B’Shevat Seder as a special meal marking the tithing date and introducing the time of preparation for Passover is sensible from a messianic viewpoint. The Passover of Messiah is about leaving the realm of sin and death, symbolized in chametz, through Yeshua’s sacrifice, and about introducing the realm of purity and immortality, symbolized in matzah, through Yeshua’s resurrection. Sin entered our world by an act of eating from a tree. The victory over sin also was obtained by means of a tree, on that day when Messiah hung on a tree and took upon himself the curse on sin pronounced by the Torah (Dt. 21:22-23; Gal. 3:13). What is the relation between the introduction of sin by means of a tree, the tree of knowledge of good an evil, and the victory over sin by means of another tree, the Cross of Messiah? Through his Cross and Passion, Messiah became the Tree of Life for all those who put their trust in him. According to an old legend, Seth, the son of Adam, after his father died, received from the Cherubim guarding the Garden of Eden, a branch of the tree of good and evil from which Chavah had eaten the forbidden fruit, as a warning reminder against the path of evil. The pious Seth planted this branch on the burial place of Adam, which later would be named Golgotha. 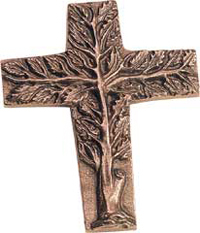 It is said that the Cross of Messiah was made from the wood of this tree. The legend makes sense. Essentially it tells us the same truth as the biblical story, namely that Messiah took upon him the consequence of sin, which is death, and thus through his death destroyed the power of death, because as completely sinlesss, he was worthy to be resurrected to eternal life. As a result of his work the destructive forces of evil in the end will be removed from the universe. When the Apostle Yochanan in the Apocalypse tells us about his vision of the City of God, he mentions the tree of life: “In the midst of the street of it, and on either side of the river, was the tree of life” (Apoc. 22:2). While in the midst of the Garden of Eden there were two trees (Gen. 2:9), here is only one. In the beginning there were two, the tree of life and the tree of knowledge of good and evil. In the end there will be only the tree of life. In the beginning man had access to both trees. He didn’t have to die because he had access to the tree of life. By his wrong choice to eat from the tree of knowledge of good and evil he lost his access to the tree of life and was subjected to the power of death. Through Messiah’s death and resurrection the effects of this wrong choice were reversed, and the dead wood of the Cross in a sense became our tree of life. In the renewed creation of the resurrection the tree of knowledge of good and evil is no more. We as believers are fruits of the Tree of Life, i.e. fruits of the Cross of Messiah. The resurrected Messiah himself is the first fruits, because he inherits eternal life by his own merit. As included in him we are sanctified in the first fruits, and inherit eternal life by his grace. The festival of Tu B’Shevat for Messianics thus highlights our inclusion in Messiah as the first fruits (cf. I Cor. 15:20). In him who is fully dedicated to HaShem we are acceptable too (cf. Lev. 19:23-25). For the liturgical year Tu B’Shevat has an important function. By reminding us of the approaching season of Passover, it encourages us to start the process of cleansing, which not only applies to our houses but also to our hearts and our daily walk of life. The time between Tu B’Shevat and Passover is particularly fit to help us in identifying with the sufferings of Messiah and making us ardent in our efforts of removing all traces of sin. The festival of Purim, which occurs during this time of preparation, is in line with it and gives it additional weight. Historically, the fast of Esther was right before Passover (cf. Est. 3:12; 4:15-16), and the hanging of Haman the wicked occurred at Passover (cf. Est. 5:1-8; 7:1-10). Purim has thus its own close connection to Passover, and the defeat of the wicked Haman symbolizes and anticipates the defeat of the serpent and his seed, i.e. the devil and all the forces of evil. That the crucified Messiah is our Tree of Life is beautifully expressed in a famous hymn of Venantius Fortunatus (VIth century), which can be sung at the Tu B’Shevat Seder. And thy load, most sweet is he. Gently on thine arms extend. Of the Lamb for sinners slain.